Well, dear Academicians, the Christmas Season has come to its completion. The next highlight of the Church's Liturgical Year will be Ash Wednesday (which will come earlier this year, on February 13, 2013). 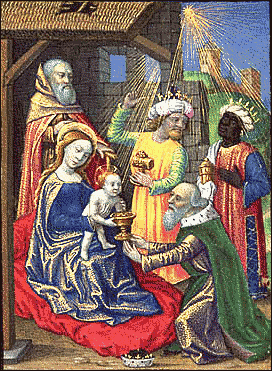 The Three Magi's liturgical visit with the Infant Christ, the Holy Virgin Mother, and holy Saint Joseph has come to its completion. They are departing us to go home. So, we wave goodbye to the Balthasar, Caspar, and Melchior, watching them return to their liturgical homelands until next Epiphany. But, what's this? I find that they have left you and me a "see you next year" gift! They are an exceptionally wise and generous triumvirate, those three Magi! Their gift to us is a roadmap: a set of directions for journeying successfully toward Easter and through the rest of this Liturgical Year! Click on the "Play" button below, and see what the Three wise Magi have gifted you with! The song was written and sung by James Taylor. A few of his interpretations of the meaning of the Magi's visit are simplistic and not based in true faith. But it's a cute song, and it lends to the message I'm trying to transmit here. I hope you'll enjoy the video and find it helpful.